Re Michelle's request, inspired by the post below from earlier this morning, here's the recipe for my (not at all disgusting, I assure you!) ginger-garlic-lemon drinkable stew. I swear by it. Combine in a medium-sized saucepan: the juice of one lemon, a good two inches of peeled ginger root, five to ten peeled and crushed cloves of garlic. 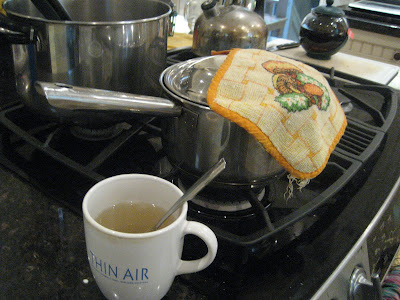 Cover with water, anywhere between four to eight cups, and simmer for awhile. Pour into a mug with lots of honey, and sip while hot. A sprinkling of cayenne pepper is optional in the original stew. A peppermint tea bag is also optional in your mug. I keep adding water and stewing and sipping all day.